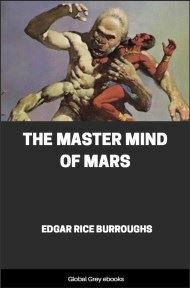 This is the eighth book in the Barsoom Series. John Carter reprises his role of hero as he vows to bring an end to the Assassins Guild. He ventures in disguise to the city of Zodanga in a fierce attempt to overthrow Ur Jan, the leader of the Assassins. 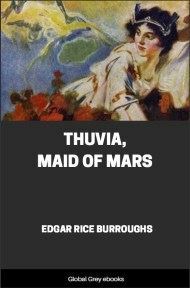 His adventures embroil him in the rivalry of two competing scientist-inventors, and eventually leads him to the nearer Martian moon in order to rescue his kidnapped wife, Dejah Thoris. Interesting side note: The first letter of the preface and the subsequent twenty-four chapters of the book form an acrostic message from the author to his second wife Florence. The message reads "To Florence with all My Love Ed." Over nineteen hundred miles east of The Twin Cities of Helium, at about Lat. 30 degrees S., Lon. 172 degrees E., lies Zodanga. It has ever been a hotbed of sedition since the day that I led the fierce green hordes of Thark against it and, reducing it, added it to the Empire of Helium. Within its frowning walls lives many a Zodangan who feels no loyalty for Helium; and here, too, have gathered numbers of the malcontents of the great empire ruled over by Tardos Mors, Jeddak of Helium. To Zodanga have migrated not a few of the personal and political enemies of the house of Tardos Mors and of his son-in-law, John Carter, Prince of Helium. 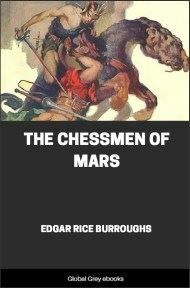 I visited the city as seldom as possible, as I had little love either for it or its people; but my duties called me there occasionally, principally because it was the headquarters of one of the most powerful guilds of assassins on Mars. 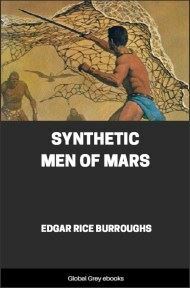 The land of my birth is cursed with its gangsters, its killers, and its kidnappers but these constitute but a slight menace as compared with the highly efficient organizations that flourish upon Mars. Here assassination is a profession; kidnaping, a fine art. Each has its guild, its laws, its customs, and its code of ethics; and so widespread are their ramifications that they seem inextricably interwoven into the entire social and political life of the planet. For years I have been seeking to extirpate this noxious system, but the job has seemed a thankless and hopeless one. Entrenched behind age-old ramparts of habit and tradition, they occupy a position in the public consciousness that has cast a certain glamour of romance and honor upon them. The kidnappers are not in such good odor, but among the more notorious assassins are men who hold much the same position in the esteem of the masses as do your great heroes of the prize ring and the baseball diamond. 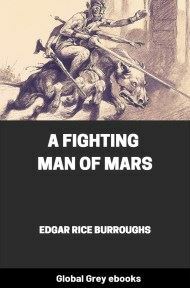 Furthermore, in the war that I was waging upon them, I was also handicapped by the fact that I must fight almost alone, as even those of the red men of Mars who felt as I did upon the subject also believed that to take sides with me against the assassins would prove but another means for committing suicide. Yet I know that even this would not have deterred them, had they felt that there was any hope of eventual success. That I had for so long escaped the keen blade of the assassin seemed little less than a miracle to them, and I presume that only my extreme self-confidence in my ability to take care of myself prevented me from holding the same view. Dejah Thoris and my son, Carthoris, often counseled me to abandon the fight; but all my life I have been loath to admit defeat, nor ever have I willingly abandoned the chance for a good fight. 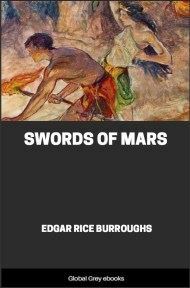 Certain types of killings upon Mars are punishable by death, and most of the killings of the assassins fell in such categories. So far, this was the only weapon that I had been able to use against them, and then not always successfully, for it was usually difficult to prove their crime, since even eyewitnesses feared to testify against them. But I had gradually evolved and organized another means of combating them. This consisted of a secret organization of super-assassins. In other words, I had elected to fight the devil with fire. When an assassination was reported, my organization acted in the role of detective to ferret out the murderer. Then it acted as judge and jury and eventually as executioner. Its every move was made in secret, but over the heart of each of its victims an "X" was cut with the sharp point of a dagger. We usually struck quickly, if we could strike at all; and soon the public and the assassins learned to connect that "X" over the heart as the mark of the hand of justice falling upon the guilty; and I know that in a number of the larger cities of Helium we greatly reduced the death rate by assassination. Otherwise, however, we seemed as far from our goal as when we first started. Our poorest results had been gained in Zodanga; and the assassins of that city openly boasted that they were too smart for me, for although they did not know positively, they guessed that the X's upon the breasts of their dead comrades were made by an organization headed by me. I hope that I have not bored you with this exposition of these dry facts, but it seemed necessary to me that I do so as an introduction to the adventures that befell me, taking me to a strange world in an effort to thwart the malign forces that had brought tragedy into my life. 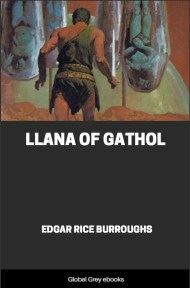 In my fight against the assassins of Barsoom, I had never been able to enlist many agents to serve in Zodanga; and those stationed there worked only in a half-hearted manner, so that our enemies had good reason to taunt us with our failure.